A general overview of each follows. More detailed information is available in the Gas Technology AdvisorTM module on Boilers. The most common methods of reducing NOx emissions from the combustion of natural gas in a boiler include low excess air firing, burner modification or replacement, and flue gas recirculation. Reducing the excess air in a boiler limits the amount of nitrogen available for NOx formulation. This can be accomplished with the installation of an oxygen trim system, resulting in NOx reductions in the 5-10% range. There is a limit to how far the excess air can be reduced (usually 3% O2) until carbon monoxide (CO) formulation and unburned hydrocarbons become a concern. Burner modifications or replacement (referred to as low-NOx burners) are used to stage the combustion in the boiler furnace. Instead of producing a very robust full flame, the burner with staged combustion delays the combustion process. This results in a cooler flame, which suppresses thermal NOx formulation. NOx emission reductions of 40-85% can be achieved with staged combustion, which is used in conjunction with reduced excess air. For reductions in NOx beyond those achievable with low-NOx burners, flue gas recirculation (FGR) is used. In a FGR system, a portion of the flue gas is recycled from the stack into the burner wind box. Upon entering the wind box, the recirculated gas is mixed with combustion air prior to being fed to the burner. The recycled flue gas consists of combustion products which act as inerts during combustion of the fuel/air mixture. The FGR system reduces NOx emissions by two mechanisms. Primarily, the recirculated gas acts as a dilutant to reduce combustion temperatures, thus suppressing the thermal NOx mechanism. The amount of FGR can be increased up to about 25% for increased NOx reduction to the desired level, with the limitation being the impact on flame stability. FGR is usually used in combination with low-NOx burners and reduced excess air to achieve reductions in NOx emissions of 60-90% from uncontrolled levels. The application of FGR usually requires the replacement of the boiler burner, fan and wind box. Other combustion control techniques used to reduce NOx emissions are water or steam injection and gas reburning. Water or steam injection is similar to the use of overfire in combustion staging. 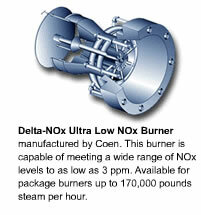 Water or steam can be injected into the burner flame to reduce flame temperatures and reduce thermal NOx formation. This method can result in NOx reductions in the 50-70% range. However there is a significant efficiency penalty associated with the level of injection and this method of control has become less popular with the advances made in low-NOx burner technology coupled with FGR. Gas reburning injects additional amounts of natural gas in the upper furnace, just before the overfire air ports, to provide increased reduction of NOx. This method of gas injection for reburning has been used with some success to reduce NOx emissions from coal boilers. The Forced Internal Recirculation (FIR) burner, a new low-NOx burner developed by The Gas Technology Institute, has demonstrated a capability to meet or exceed the lowest NOx levels achievable through other combustion methods. The main advantage of this burner is that FGR is not required. The burner uses premixed substoichiometric combustion and a two-stage design to force internal recirculation of combustion products. This unique design brings secondary air through the primary combustion zone and enhances internal recirculation of gaseous products of partial combustion resulting from lower flame temperatures. Successful development of the FIR burner will meet an unfulfilled market need for a cost-effective, low-emission boiler burner. The basic technology provides a solid foundation for further advancements in single digit NOx emission burners (< 10 ppm NOx) to meet future environmental regulations across many applications.